Building a relationship with anyone requires time and effort. Once a relationship is established, both parties must work to maintain it. If recruiters and hiring managers want to really connect with college students, they should consider showing up on college campuses. These are networking opportunities not only for students but also for employers. Employers can create connections by personally interacting with college students, answering their questions, or by handing out business cards or other company information. Recruiters and hiring managers who spend time and energy on college campuses can not only network with students but also potentially build long-term relationships with schools. Tom Vecchione, Assistant Vice President and Executive Director for Career Development at University of the Pacific, shares his thoughts on the importance of recruiters attending networking events on college campuses. “It’s important for organizations with ongoing hiring needs at the college degree level to build and maintain excellent working relationships with their target institutions. Many times, it takes a year or two for given organizations to begin building strong brand reputations at colleges and universities that will attract the top caliber talent they (and other employers) desire. Creating good recruiting relationships means you want college students talking to and talking up your organization to other students. Nothing is more powerful than trusted friends making a referral based on their own first-hand experience. Approved sponsorship opportunities with key student groups can also help cultivate student recognition of your organization. Learn more on the importance of networking on the College Recruiter blog and follow us on LinkedIn, YouTube, Twitter, and Facebook. 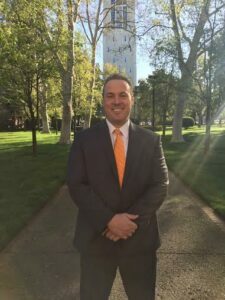 Tom Vecchione is the Assistant Vice President and Executive Director for Career Development at University of the Pacific. Tom earned a Ph.D. in Counseling from Ohio University, specializing in college student career development. Tom has 22 years of progressively, responsible experience in career services/placement and university student affairs and works extensively with employers seeking to hire college students or alumni.